I was sent this product for review purposes but since the whole skin eruption business I’ve had to stop using anything outside of my new routine until I get things back on track (maybe not ever again if what I’m using now really works!). But I wanted to give a mention to this lovely brand really. I love the packaging which is clean and fresh looking. The ethos of the brand is that Nourish use advanced ingredients to nurture your skin. And they offer a variety of products for a variety of needs that you can mix and match. All the products are anti-ageing and tailored to skin types and needs. I’ve been having a really good look at the website and I’m seeing words like peptides, hyaluronic acid, and lots of other goodies we know to be great for our skin. There’s also a really large product range at what I think are really reasonable prices. The products are all cruelty free and vegan too. The cleanser pictured above hasn’t had a fair enough go from me to review it but on the few occasions I used it, it certainly felt lovely and effective. The Balance Detoxifying Cleanser (£9.95) is recommended for combination skin to cleanse and restore the natural barrier of all skin and is a blend of apple extract to refresh and light emollients. You can find full ingredients lists for all products on the website by the way which for those who like to know exactly what they are using, is a fabulous thing. You simply swipe it one with cotton wool and rinse away with cool water. I would recommend using this after removing make up. I certainly plan to take a closer look at some of the body products while I’m giving my face a break! The Golden Glow Toning Souffle sounds to die for! If the range sounds like it might be for you, you can purchase here. So here’s something a little bit different! How about a range based on the methods Ancient Egyptians used to create eye products? The Eye of Horus is of course the Egyptian Symbol representing healing, wisdom and prosperity to it’s bearer. The Eye of Horus products are naturally formulated, as I mentioned, based on the methods used by Ancient Egyptians. What this means are that they are made with plant based ingredients and waxes, such as Carnauba Wax, Beeswax, Rice Bran Wax and Candelilla Wax. The range is the star product, a mascara, and a variety of eye liners and accessories. The idea is that the range is affordable, non irritating and effective and especially suitable for sensitive eyes. I was sent the Mascara, Teal Goddess Pencil and Sharpener. Absolutely love the packaging which is very in-keeping with the theme. This pencil is formulated with Jojoba Wax and Mango Oil and is completely waterproof. Brilliantly, it comes with a smudger on the other end so you can blend it out. I can testify that this doesn’t budge all day on my upper lid (although didn’t last quite all day on my waterline), yet it did wash off easily and most importantly I didn’t get any of that annoying transfer onto my upper lid after a full days wear. This is really lovely and comes in a few different shades. This has one of those brushes I don’t get on too well with , it’s by no means massive but I still manage to blob it all over my eyelid on application… that’s just me being inept thought, for me personally the smaller the better. This mascara doesn’t promise volume or length or curl. This simply promises to enhance your natural lashes and it really is remarkable. Zero clumping. Zero flaking. Absolutely no smudging over the course of the day. Washes off easily and best of all promises to condition and strengthen while you’re wearing it, and thus assist in lash growth. I find this does and amazing job of grabbing and separating each lash and evenly coating it with intense black colour. Very nice indeed. And a perfect every day mascara because it flatters and emphasises without being dramatic. The sharpener, well it’s a great sharpener and is a great price of £3.50. The pencils, because they are choc full of lovely oils and waxes really need a good quality sharpener and this does a great job. So here are the two products in use. You Can buy the Eye of Horus range from Cocktail Cosmetics who are absolutely brilliant and I was buying make up from them long before I was blogger. If you buy any Eye of Horus product full price you can get 50% off several of the liners AND get a free mirror, purse and sharpener! I don’t know how long this offer runs for so hop to it! Eye of Horus products are all Cruelty Free. Still loving everything from Brenda Anvari I’ve tried, with everything having become a staple for me. The latest product to join my regime is the Firming Eye Gel. For your £15.95 you get 15ml of product, which I believe is just a little lower than average for a quality brand and product. The gel itself is really gorgeous, although on the website the picture is of a clear gel, this is actually a green gel, which looks positively inviting and cooling. Ingredients include Aloe and Seaweed which are of course rich in antioxidants and there’s vitamin E to hydrate and firm the skin and help reduce the appearance of under-eye circles. It is of course, as a gel, soothing and has a de-puffing effect as it cools and soothes. I have to say I find eye products a little on the tricky side to review because I’ve not tried one that hasn’t made any difference. I think the reason for this is simply that if the delicate skin around the eyes is kept moisturised then it’s plumper and fine lines appear smaller. Ultimately though, that means I can say that I have seen results using this product, which I have come to expect from the brand. This is such a lovely light product though, and I think especially wonderful in the Summer months. For a cooling soothing finish I have long been a fan of the Clinique All About Eyes roll on product which I got a bit addicted, but this is easier on the purse and does just as good a job. Another Brenda Anvari winner. I won’t rest until you all know this brand! I recently told you about my visit to Visage House in Exeter, to try out CACI, the non-surgical face lift. I told all about CACI, what it is, how it feels and what results you can expect to receive. Today I want to tell you about Visage House, Brenda Anvari’s products and about the things I learned about my skin. When I went for my appointment I nearly didn’t spot Visage House. I actually walked past it twice…I was looking for your traditional beauty salon and I bypassed the gorgeous looking gift shop rammed full with elegant bottles and potions and jewellery. Then I spotted where it was and headed in to a warm welcome, offers of a drink while I filled in a form and took in my surroundings and waited for my therapist Paula. When Paula was ready I was ushered into the treatment room which was softly lit and there, in the middle was to all intents and purposes a bed. I’m sure it was the usual type of couch, but there was no mistaking the the big thick pink polka dot duvet. I was asked to remove my top, and shoes and to pull my bra straps down so that my shoulders and upper chest were uncovered, and then I hopped into bed and was tucked in. Very cosy it was too! Considering it was a very hot day, I didn’t feel at all hot. I don’t quite know how that worked, but the temperature was just dandy. The last time I had a facial (at another salon), it was so hot and stuffy I left with a horrific migraine. This was absolutely fine. And I might add very comfortable. So Paula asked me if I had any concerns about my skin, and I saw the opportunity to mention the bumps under my skin that have been plaguing me for so long now. I’ve tried so many things to be rid of them but nothing has worked. And in addition, I’ve never actually known what my skin type is as I never seemed to fall into any of the neat brackets. I have hormonal spots, I have dry patches around my nostrils, the bumps under my skin all around my jaw, chin and cheeks, and I’m in my late thirties so concerned about ageing. Now I know what I am! So Paula decided to examine those bumps and told me that the contents would tell her exactly what condition my skin is in. And so she set about, well, I’m sure there’s a technical term for it, but the best way I can describe it, is squeezing. It was fairly uncomfortable at times, and she only did a few because that wasn’t why I was there. And so it is that the contents of my little bumps are hard. Which tells Paula, and me, that my skin is dehydrated, other factors, based on our discussions, also presented the us with the fact that my skin is sensitive. This is the best picture I could find of “the bumps”… I think you can just see my cheeks and chin aren’t smooth. I cannot tell you how delighted I am to learn this. I know it sounds weird to learn your skin has a few problems, but it’s not, the fact is that once you know what the problem is, you can go about fixing it. Before now I’ve been fumbling around blindly trying to treat my spots, care for the dry bits, and worrying about ageing. All of which I’ve been doing and probably making things worse in the process. So, the way forward for me is to have a deep pore cleansing facial, in which she’ll clear out all of those blocked pores and to strip back my routine to cut out all heavy moisturisers, all anti ageing products, all spot creams, just everything and go right back to basics with the most simple products… and then and only then, when my skin is clearer and less bumpy and reactive, then start adding in anti ageing products where necessary. And of course, the recommended products are Brenda Anvari products. Now Brenda Anvari is the owner of Visage House, but for many years Brenda worked for Elizabeth Arden, training therapists all over Europe, before moving with Elizabeth Arden to New York to look after their US Salons, train all new therapists and to develop new treatments and so she bought a great wealth of experience and knowledge with her when she opened her own salon in Exeter. Along with the salon is a great range of products, for your skin, for your body and for scenting your home. And what I’ve tried is so beautiful I’m convinced enough to be ditching everything I’ve previously used. I was lucky enough to be sent home with the Skin Tonic and the skin serum, both of which I’ve only been using for a week now but so far so good. The Skin Tonic is a floral water toner to balance and stimulate the regeneration process, it’s also calming and so perfect for my sensitivities. 100% pure, no added ingredients, . No parabens. Gorgeous rose product my skin loves. I’ve been naughty, very rarely toning, now I’m religiously toning twice a day. This is £15.95. Then there’s the fab Skin Serum which is also rose, it’s a perfectly clear gel form, that feels slightly sticky when I apply it but absorbs so quickly into my skin it fails to cause any issue. It’s all free and infused with antioxidants and essential oils and seems to be calming a my skin quite well. After my pore clearing and and CACI, I did suffer quite an outbreak (because I have reactive and sensitive skin and it was also that time of the month) and I believe the two products I was sent home with have really helped to calm the break out also. I can’t afford to replace my whole regime with Brenda Anvari’s products, yet so I will be replacing one by one as and when I can afford it, so at the moment am reaching for the most basic bits in my collection to compliment the above two products, and I’m giving away anything fancy, rich, full of ingredients I don’t need. I’ll also be back in to the Salon for my Deep Pore Cleansing Facial. Regarding the skincare products used on me during my facial, I must give special mention to the Sicilian Lemon cleanser which smelled and felt wonderful, and also the Facial Exfoliating Cleanser. Stunning. And before I round up this super long post I must also give mentions to the body care line, I was given an arm and hand massage using a body cream which comes in several stunning varieties, I opted for Pomegranate, Raspberry and Patchouli (as stunning as I thought it would be), but other options included Lime, Mandarin and Grapefruit, Orange Blossom, Persian Rose and Ylang Ylang, Sandalwood and Black pepper. The last one is what I’ll choose next time! Finally there is also a beautiful range of home fragrance products in all of the above scents and Cranberry, Orange and Cinnamon…. I’m thinking they will make wonderful Christmas Presents. 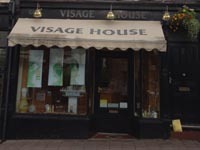 Whilst those of you not local to Exeter can’t very easily go along to Visage House for a treatment (if you are local, you should) but should any of the products take your fancy, you can buy them all from the Visage House website. Delivery is a hefty £6.25 per order, but I understand that all items are sent by courier. Amazing. My skin is already seeing the benefits and when I move house (have I mentioned I’m moving imminently??) then I’m going to ensure the house is beautifully scented too. I was recently asked if I would write about and review JooMo and I have to admit to being hesitant, but then I spotted that the product claims to be the first 100% natural facewash which I though gave it an interesting slant for me to write about. What I failed to notice was that this is a face wash exclusively for Young and Sensitive skins. I am of course not young. I have however recently learned that I am sensitive, actually very sensitive. Even so I left this on the shelf for a while wondering what I was going to do with it. The last time I tried to use skin care for young or spotty skin, it was far far to harsh for me and I’m still suffering the consequences of that now. Before I tell you about how I came to eventually use this and what I think of it, let me tell you a bit about it. The 100% truly natural face wash is apparently something of a “Holy Grail” in cosmetic formulation, with many products that claim to be so, actually far from it. JooMo contains the skin care product SaponinJ which is a skin repair system that consists of Saponins, Essential Oils, Sea Salt, Natural Sugars, Natural PH Modifiers, Emollients and other things with the aim of repairing damage caused by synthetic products, rebuilding defenses to protect against allergies, infection and inflammation, making it the ideal product for youngsters who suffer from sensitive skin, prone to acne and blackheads. So back to the product and me. I recently underwent an intensive facial treatment which involved some deep pore cleansing (trust me, the poor practitioner has only just started as that wasn’t the real reason I was even there). As a result of the prodding and poking, my skin is much much smoother but my sensitive skin didn’t take too kindly to the trauma and I’m suffering a massive break out. While I was having this treatment, the lovely girl who was looking after me told me the best thing I could do was strip everything back to absolute basics. Basic cleanse, basic tone, basic moisturise, gentle exfoliation three times a week and a nourishing mask a couple of times a week. Get rid of all my fancy heavy creams and potions, and start from scratch. So I know which brand I’ll be going for when I do, more on that in another post, but for now, I was wondering what best to wash my face with and this looked like a good option. It certainly is a good option, my skin LOVES it. It’s a strongly scented face wash that doesn’t foam much if at all, and its scented with honey, orange and copious amounts of cinnamon. It’s very Christmassy actually. But my skin feels just lovely, my spots are calmer, the rest of my skin is soft and happy, dry patches are disappearing and all in all, things are on the up. So whilst JooMo is clearly targetted at young skins with very good reason, I would strongly recommend this if you have sensitive, reactive or spotty skin. It won’t strip away all the good oils, which I find is the problem with most spot treatments and ranges, it’s just not for my age group and it dries my skin out. This absolutely doesn’t. It’s lovely. Get yours here for a bargainous £4.75 plus postage. You may not yet have heard of Face the World, but I’m guessing it won’t be too long before you starting hearing more about this brand. Face the World (FTW) are a new facial care company who have developed a line of products and facial treatments. All of the products took over four years to develop and were extensively tested on all skin types and are completely cruelty free. The overnight Skin-Booster Serum was previously given to clients, in sachet form after having a FTW facial, but due to popular demand, it has now been released as a stand alone product. So what we’ve got is a very pretty little tube of opalescent serum. It’s so pretty. I tried really hard to capture how this looks, but I totally failed, you might be able to see the opalescence if you look really closely! Okay, so what we have are some beautiful ingredients, Rosehip Oil, Evening Primrose Oil, Wheatgerm Oil, Wheat Seed Extract, FTW Ceramide Technology Blend (essentially the emollient that acts as the carrier), Vitamin A, Vitamin E, Meadowfoam Oil and Shea Butter. This is a tricky one for me to review so I’m going to start off with my first and only negative about this product. It contains silicones. I seem to react to some products with silicones in and not others, I have not yet discovered if it’s one type of silicone that I have a problem with or if its silicones in general. Now my skin has, spot wise, been marginally worse since I’ve been using this…BUT my skin does seem to be getting worse as I get older and if I was reacting to this I’d expect to have much worse skin, not just marginally worse skin. All I can say is that if you do know you don’t get on with silicones, then this probably isn’t for you. Moving on, firstly, this has the scent of Stargazer Lily, it is beyond beautiful. I love that smell so much. Secondly, this feels beautiful to apply, it has that very distinctive feeling of a product that contains silicones, that’s not a negative, unless you don’t like skin that feels like velvet that is! The third and final thing and that is that if I apply this at bedtime, when I wake up in the morning, my skin is soft, plump and looks great (spots aside). So this is a bit of a mixed review but I can sum it up and say that if you don’t have a problem with silicones, this does wonders for your skin, smells gorgeous and makes you look refreshed in the morning. It’s good stuff. You can buy this here, for £40. Absolutely LOVING these products I was sent to try out from Mary Elizabeth Bodycare. Before I talk about the products individually in a little more detail, I just wanted to tell you a little about the company and products generally. The ethos is simple. Natural, organic, effective products to help you look good and feel good. There are no boxes, to save on wasteful packaging. Each product contains enough essential oils to ensure that they have all the beneficial properties of the oils, rather than just a minimal token amount to enable the company to list them in the ingredients, all products have undergone all EU testing requirements as well as challenge and stability testing and finally Meadowfoam Oil is used in the moisturiser and balm. This is a fairly new oil in skincare, is apparently supernourishing and makes any product “luxurious and high end” according to current reviews of the oil, I know nothing of Meadowfoam Oil but will be investigating! In 2010 Cecilia Rathe had skin cancer, and whilst the treatment for the cancer was successful, it left her skin raw, irritated and with a high possibility scarring. She tried various products to no avail but being a fully qualified aromatherapist, it was only a matter of time before she used her knowledge and skills and created a product herself…which worked. And Mary Elizabeth Body Care was born. Here’s a quick run down of the products. A beautiful facial scrub made with Camellia Oil, Avocado Oil, Geranium and Lavender oils and rich in Vitamin E. This is beautiful, you just massage into your skin, dampen, massage again and then remove, you can use this once daily, but I’ve been using it probably every couple of days, only because that’s the best way I can fit it into my already working very well regime. Would definitely without question recommend and re-buy. What a beautiful moisturiser. I think you can see in my photograph, it has the most beautiful texture. At first you think this might not absorb too well, as it feels richer than you think when you apply it, but actually it’s mere moments before it’s disappeared into your skin. By the time I’ve reached into my drawer to decide on the day’s foundation, my skin is ready to go. Its full of beautiful ingredients, Jojoba, Meadowfoam, Frankincense, Rose, Vitamin E, Lavender… it smells beautiful and it feels beautiful. Another beautiful product. Jojoba Oil, Calendula Oil, Juniper, Geranium, Chamomile… oh it really is lovely. This is by no means a heavy handcream, but it’s certainly moisturising and has become my bedside table handcream of choice, joining the elite products that make part of my bedtime ritual. This is a handcream but you could use it anywhere, I’ve used it on my rough upper arms with some success. This is the only product I’ve not used a great deal, for no other reason than that Tea Tree and I are not the best of friends and I have many problems with it in the past. When using on wound they get worse, when used on spots they get worse and so it is with this that I’ve only tentatively given this a whirl, and that was on my cuticles. It has a lovely texture, and if you are not weird with tea tree like I am, then you can use this anywhere, lips, heels, elbows, cuticles… anywhere. What a lovely brand, truly, the products feel like they’ve been made with lots of tlc and are truly beautiful. At the present time the products are available only from the Mary Elizabeth website but I hear a couple of national online stores are interested in stocking the brand so watch this space. I’m totally loving Melvita right now, these three products in particular. I’m using more Melvita bits and bobs but I’ll do a blog post on those another time, for now I’ll just concentrate on these three skincare products. First up, the Cleansing Milk, a truly beautiful cleanser that does a wonderful job of cleaning my face at the end of the day. Don’t get me wrong, I only use this a couple of times a week as I wash my face with water and product at all other times but when I’m feeling tired or lazy I smother this all over my skin, rub it in and then tissue off and follow up with Micellar water (which I’ll talk about in a minute!) and my face feels so soft and clean. Rich in rose, Linden Waters and aloe vera it also has beautiful shea and mango butters along with Acacia Honey, Olive and argan oils, all blended together to create a very gentle product that does a fantastic job, even making light work of my mascara. 200ml is £16 and well worth it for those lazy days! After I’ve used the Cleansing Milk I always follow up with the Fresh Micellar Water. If I’ve not been wearing make up I’ll just use this alone. Cleanses, tones and removes make up in one step. Created with wild rose petal extract and rose floral water. Again this leaves my skin feeling fresh and crystal clear. This is part of the new Rose Nectar range which is on special offer, you can buy two items for £25 or 3 steps for £44 with free postage. The Fresh Micellar Water is £14.50 for 200ml and I love it. Finally is a product I took a while to warm to as I wasn’t too sure what to do with it, the Rose Extraordinary Water. It’s described as a skin prep lotion, its anti-aging product containing Hyaluronic Acid and Glycerine and it has a strange texture, its like thick water! I suppose you’d call it a gel. It’s very lightly scented and also has rose floral water for rejuvenating and marsh clover for firming. I’ve been using it in two ways, firstly after the above two products as a toner. Secondly, I have this strange habit of taking my showers in the late afternoon rather than evening or morning and I always used to have this quandry as to what to put on my skin at that time of the day as it felt too early for my night cream, now I just slather on this beautiful gel, it leaves my skin soft and moisturised and takes me through until bedtime when I can use my night cream. Truly a lovely product. £14 for 100ml. For those who don’t know anything about Melvita the firm is dedicated to natural products, 95% of the total ingredients are from natural origin, water included. At least 10% of the ingredients are from organic farming and at least 95% of the total plant-based ingredients are organic, all ingredients are traceable, all packaging is recyclable and I think it probably goes without saying the whole brand is cruelty free.